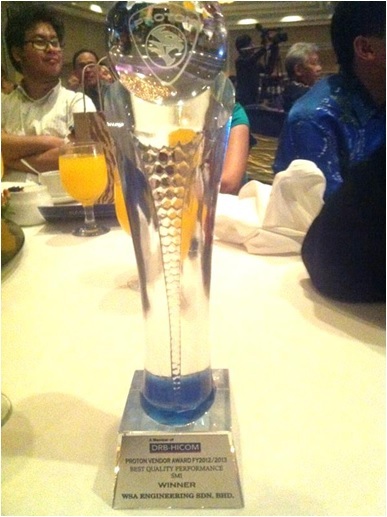 WSA had won the best Quality Award in the SMI category for 2012 / 2013 at the Proton’s Annual Vendor Dinner and Awards Ceremony. There are four categories which include Best Delivery, Best Cost, Best Quality and Best Engineering Award. By winning the prestigious award, WSA has stamped its mark within the automotive community by giving the best QCD + Engineering to its customers. As the journey continues, WSA is poised to continue its best practice to foster a win-win situation among its valued customers.